Warm Nights & High Yields of Corn: Oil & Water? he "dog days of August" are upon us with warm and uncomfortably muggy days accompanied by warm and uncomfortably muggy nights. Invariably, conversations down at the local cafe over coffee or the neighborhood tavern over a few beers turn to the inevitable opinion that "...these warm nights simply cannot be good for the corn crop." One of the concerns often expressed about the effects of warm nights during the grain fill period is that excessively warm nighttime temperatures result in excessively high rates of maintenance respiration by plants. That physiological process oxidizes photosynthetic sugars and provides energy for the maintenance and repair of plant cell tissue, which helps the photosynthetic "factory" continue to operate efficiently. While useful for maintaining the function of the photosynthetic factory, maintenance respiration does not directly increase plant dry weight. Excessive rates of maintenance respiration are thought to wastefully "use up" photosynthetic sugars that would otherwise be available as photoassimilate for use by the developing kernels. While the relationship between temperature and the rate of maintenance respiration is well documented, the practical significance of excessive maintenance respiration rates to a full-size corn crop during the grain fill period is not well documented in the research literature. 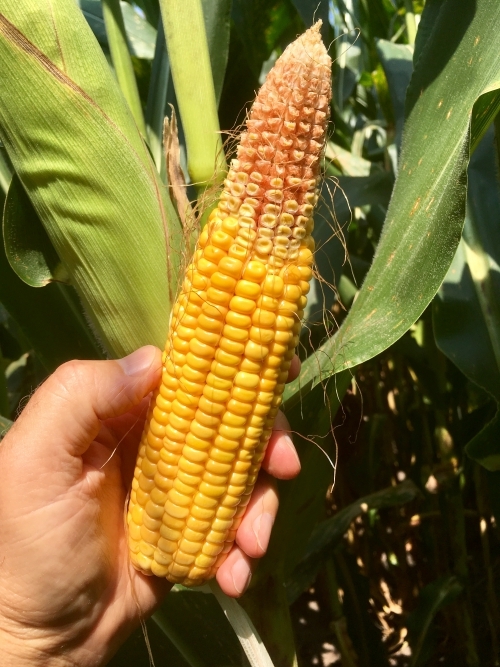 Perhaps more importantly, warmer temperatures from pollination to kernel maturity increase the rate at which the crop moves through the grain filling stages. Consequently, the number of days devoted to the grain fill period decreases and kernel maturity occurs earlier with warmer temperatures than with cooler temperatures. It is also true that warmer temperatures increase the daily photosynthetic rate and increases the amount of photosynthetic sugars produced per day (potentially a good thing), but it appears that shorter grain fill duration trumps faster photosynthetic rate and so yield tends to decrease with warmer grain fill periods. Another consideration with grain fill periods that are warmer than usual AND muggy is that such weather conditions are conducive for the development of several important foliar corn diseases, including gray leaf spot (Cercospora zeae-maydis). Severe outbreaks of such diseases early in the grain filling period can destroy significant amounts of the "solar capture components" (i.e., leaves) of the photosynthetic "factory", resulting in significantly less production of photosynthetic sugars, which translates into yield loss. Having said all that, does history support the opinion that "...these warm nights simply cannot be good for the corn crop?" Considering that July and August typically represent the bulk of the grain fill period for corn in Indiana, that time period merits a look to see whether there is a strong relationship between statewide temperature deviations and grain yield. Figure 1 illustrates that relationship for statewide departures in July & August temperature and statewide grain yields for the period 1994 through 2015. Five of those years represented record-setting or near record grain yields and three represented very poor corn years with statewide yields more than 10% below trend, including the 2012 drought year when statewide corn yield was nearly 38% below trend. All the other years represent statewide corn yields with single-digit departures from trend. There is a reasonable relationship between these departures in temperature and departures in yield. In general, cooler July and August grain fill periods tend to result in above average statewide corn yields and vice versa for warmer than normal July & August grain fill periods. However, temperature departures from normal only accounted for about 38% of the annual variability in statewide grain yields. Obviously, rainfall during the grain fill period is also important in determining grain yield. Figure 2 illustrates the relationship for statewide departures in July & August rainfall and statewide grain yields for the period 1994 through 2015. While the nature of the relationship is what one would expect, i.e., "rain makes grain", it is not a very strong one. Rainfall departures from normal only account for about 13% of the annual variability in statewide grain yields. Figure 3 illustrates the relationship between statewide grain yield and a simple index that combines the temperature and rainfall departures. The graph basically reinforces what we expect: Cooler and wetter July & August grain fill periods tend to have above average statewide corn yields and vice versa for warmer and drier July & August grain fill periods. So, where does this discussion leave us relative to the 2018 Indiana corn crop? After all, statewide corn crop condition ratings throughout the season have been consistently strong, averaging more than 70% "good" to "excellent" in USDA-NASS parlance (USDA-NASS, 2018c). The initial 2018 USDA-NASS Crop Report released Aug. 10 (USDA-NASS, 2018a) estimates Indiana corn grain yield will be 186 bu/ac, equal to 8.5% above the trend yield of 171.5 bu/ac. While "slow out of the gate", the rapid progress of planting statewide in 2018 coupled with warmer than normal temperatures in May and June enabled the young corn crop to develop at a near record fast pace. That rapid vegetative development resulted in silking statewide occurring almost 2 weeks earlier than the 10-year average (USDA-NASS, 2018c). However, while the earlier onset of silking may result in earlier grain maturation, it does not necessarily mean that the grain filling period itself will be shorter. It may seem surprising to some, but statewide average temperatures for Indiana in July were about normal (Midwest Climate Watch, 2018). Initial grain fill development rates following the completion of pollination, therefore, would have been approximately normal also. Rainfall statewide ranged from 75% to 100% of average, with areas in the NW and SW only 50% to 75% of average (Midwest Climate Watch, 2018). Not surprisingly, significant kernel abortion is evident on ears in fields that were stressfully dry during the blister and milk stages of kernel development. In contrast to July, average temperatures during the month of August to date have been 1 to 3 degrees F warmer than normal across the state (Midwest Climate Watch, 2018), which likely increased grain fill rates per day but may have also hastened grain fill development rates. However, dough stage of the corn crop statewide, as of Aug 12, remains about 2 weeks earlier than the 10-year average (USDA-NASS, 2018c). Rainfall for the month to date has been above normal for much of the state, with the exception of parts of WC and SW Indiana where rainfall totals have been as low as 50% of normal (Midwest Climate Watch, 2018). The corn crop statewide is certainly poised to finish with statewide yields above trend. The question lies mostly with "how much" above trend. The answer will rely on what happens weather-wise the remainder of the grain filling period. Ciampitti, Ignacio and Mary Knapp. 2018. Effect of high night temperatures on corn yield. K-State Agronomy Updates, Kansas State Univ. https://webapp.agron.ksu.edu/agr_social/eu_article.throck?article_id=1887 [URL accessed Aug 2018]. Lindsey, Alexander and Peter Thomison. 2018. Night Temperatures Impact Corn Yield. C.O.R.N. Newsletter, Ohio State Univ. https://agcrops.osu.edu/newsletter/corn-newsletter/2018-24/night-temperatures-impact-corn-yield [URL accessed Aug 2018]. Lutt, Nanticha, Mark Jeschke, and Stephen Strachan. 2016. High Night Temperature Effects on Corn Yield. Crop Insights, DuPont Pioneer Agronomy Sciences. https://www.pioneer.com/home/site/us/agronomy/library/night-temperature-effects-corn-yield [URL accessed Aug 2018]. Midwest Climate Watch. 2018. Midwestern Regional Climate Center. https://mrcc.illinois.edu/cliwatch/watch.htm [URL accessed Aug 2018]. Nielsen, RL (Bob). 2018a. Grain Fill Stages in Corn. Corny News Network, Purdue Extension. http://www.kingcorn.org/news/timeless/GrainFill.html [URL accessed Aug 2018]. Nielsen, RL (Bob). 2018b. Kernel Set Scuttlebutt. Corny News Network, Purdue Extension. http://www.kingcorn.org/news/timeless/KernelSet.html [URL accessed Aug 2018]. USDA-NASS. 2018a. Crop Production. United States Dept Agriculture, National Agricultural Statistics Service. http://usda.mannlib.cornell.edu/MannUsda/viewDocumentInfo.do?documentID=1046 [URL accessed Aug 2018]. USDA-NASS. 2018b. Crop Production Annual Summary. United States Dept Agriculture, National Agricultural Statistics Service. http://usda.mannlib.cornell.edu/MannUsda/viewDocumentInfo.do?documentID=1047 [URL accessed Aug 2018]. USDA-NASS. 2018c. Crop Progress. United States Dept Agriculture, National Agricultural Statistics Service. http://usda.mannlib.cornell.edu/MannUsda/viewDocumentInfo.do?documentID=1048 [URL accessed Aug 2018].